Currently, you no longer need dizziness if you want backing up data, ranging from the data file/directory, registry, to partition. Just trust all at Comodo BackUp Free Edition. If you are a person who often underestimate the importance of backing up data, Comodo BackUp has facilities scheduling the backup process so you do not have to do it manually. However, keep in mind that this application is not working to restore lost or corrupted data, but to back up and restore the backup data is already made. 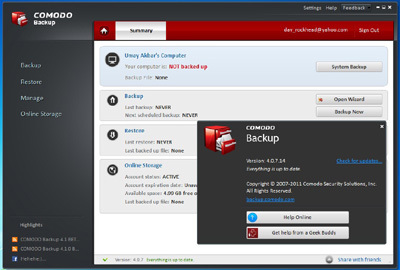 Comodo BackUp offers data backup solutions through online and offline ways. How online can be done using the cloud. So, you can store data on the server Comodo using an account that can be registered for free. For the free version, you will get 5 GB capacity. Once logged in, you will gain access to the server Comodo through Windows Explorer like access the hard disk. If you want to use offline method, you are still required to register an account. Later, you will get an e-mail indicating that you are able to download the application. In the application, there are 4 main functions are divided into Backup, Restore, Manage, and Online Storage. If you want to do a data backup, select Backup function. First of all, you will be prompted to select the source of data to be backed up. In the Custom option, choose the data who want to reserve, consisting of Files and Directories, Disk Partitions and MBR, Registry Files and Entry, User Folder, Email Accounts, Messenger, and System State. Then, specify the locations to be reserved. Then you just follow the steps usage. The results of the data backup can be recovered using a password protected so that the data will be more secure. Meanwhile, the Restore functions assigned to restore data file that has been previously reserved. Simply follow the steps as instructed. Comodo Backup offers two backup solution in a single application, offline and online. With online method, you do not need to be bothered with having to carry data using flash or external hard disk. Just connect the system to the internet and you can open files from anywhere. Plus: backup method based online and offline; online method has a capacity 5 GB; included guidelines for backup. Minus: The user must be connected to the Internet although can use offline method.